If you're looking for more sources of Dolby Atmos content, then today's your lucky day. One keen eyed viewer has noticed that the newly released Ghost in the Shell on Sky Q on-demand appears to advertise that it is 'Available in Dolby Atmos'. Dolby Atmos was first announced for Sky Q way back at the beginning of 2017, and finally arrived just before the start of the 2017 Premier League season. Prior to Christmas, the technology also graced the Sky One show Sing Ultimate A Capella. However, Ghost in the Shell marks the transition of the 3D surround sound tech towards Sky's on-demand movies. Streaming service Netflix started offering Atmos support for a small handful of movies last year. Sky Q's interface doesn't currently show which movies are and are not Atmos-compatible, and a representative from Sky told us the company has no plans to change this any time soon. Keen eyed viewers will need to look out for mentions of the technology in a movie's description. In order to actually experience Atmos you'll need compatible speakers. In an ideal world we'd all have speakers mounted in the ceilings of our dedicated home cinema rooms to create the effect of sound coming from above you, but here in the real world most of us will have to make do with upward firing speakers that bounce sound off the ceiling. Several soundbars now come packing the tech, so you shouldn't have to dedicate too much of your living room to Atmos if you want to experience it for yourself. 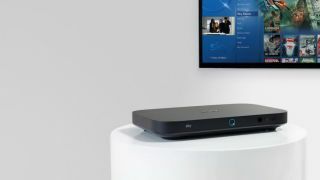 On the software side you'll have to ensure that your Sky Q box is set up to deliver the correct audio signal. Sky's troubleshooting page has information on how exactly to enable this. However, if you've got the right Sky package and the right hardware, then you should be all set to enjoy the next generation of cinema audio. Unfortunately the recently released Sky Soundbox doesn't support Dolby Atmos though, so you're going to need to upgrade if you want to experience it for yourself.